WHAT DO WE HAVE FOR YOUR TEENS? 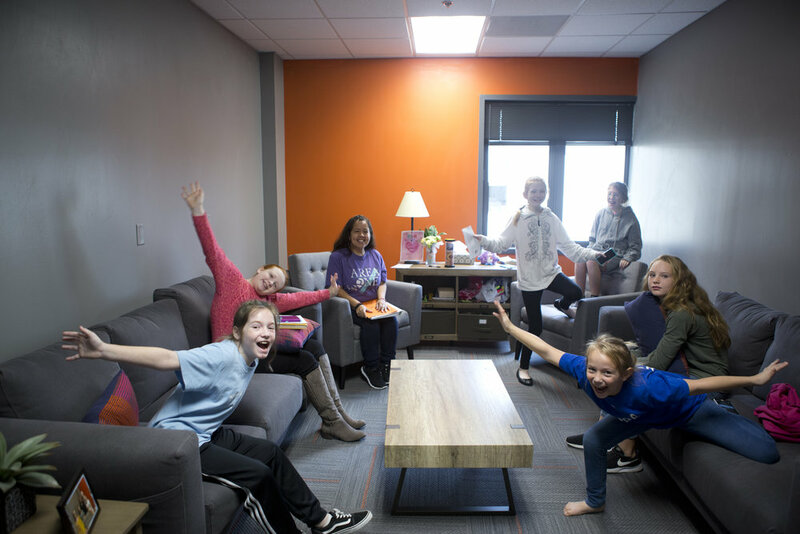 On Sunday mornings we offer a time for students in 6-8th grade to connect with others and learn about what God has to say regarding relevant issues in their life through teaching and being part of a small group. This program is offered on Sunday mornings at the 9:30 am service. Students begin their time together in the The Well Coffeeshop where they can have a snack, play games and hang out with friends before their service begins. The Coffeeshop is open on Sunday mornings 9:15-9:30 am and 10:30-10:55 am. Students are invited attend the main service at 11 am and sit in the student section located in the front west corner of the auditorium. The Well Coffeeshop is open on Mondays from 2:30-6:30 pm. Students are invited to bring their friends and hang out doing homework, playing games (video games, board games, etc), chill and enjoy free pop and lattes! Throughout the year, our volunteer team plans events for our students to have fun together, serve together and grow together. For an updated calendar of events or for more information contact Clay Gorrell, Director of Student Ministry. On Sunday mornings we offer a time for students in 9-12th grade to connect with others and learn about what God has to say regarding relevant issues in their life and experience being part of a small group. This program is offered on Sunday mornings at the 9:30 am service. Students begin their time together in the The Well Coffeeshop where they can have a snack, play games and hang out with friends before their service begins. The Coffeeshop is open on Sunday mornings 9:15-9:30 am and 10:30-10:55 am. Students are invited attend to the main service at 11:00 am and sit in the student section located in the front west corner of the auditorium. Our high school students have small group during the school year on Mondays from 7-8:30 pm. Through out the year, our volunteer team plans events for our students to have fun together, serve together and grow together. For an updated calendar of events or for more information, contact Clay Gorrell, Director of Student Ministry.